Logansport IN Tires & Auto Repair Shop | Logan Tire Service, INC. Welcome to Logan Tire Service, INC.
Logan Tire Service first opened for automotive repairs, tire sales, and wheel sales in 1946. Located at 229 West Market St. in Logansport, IN, we offer a wide range of general auto repair services to customers from Logansport, IN, Walton, IN, Royal Center, IN, and surrounding areas. As a tire dealer, we carry consumer tires, commercial tires, farm tires, industrial tires, OTR tires, and motorcycle tires from some of the most respected names in tires, like Cooper, Mastercraft, and MICHELIN®. We are open Monday through Friday from 7:30 AM – 5:00 PM and Saturday from 7:30 AM – 12:00 PM. Schedule your appointment with Logan Tire Service online today for superior service from a group of automotive professionals. 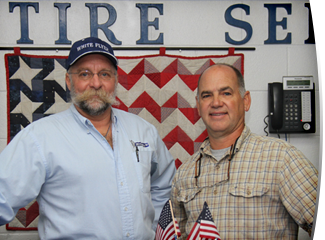 Logan Tire Service: Serving the community generation after generation.